You’ve been there, I’m sure. We all have. You’re standing, arm cocked, lure dangling, ready to cast. A moment before, you heard a smashing hit around a bend in the shoreline or under so kind of structure - trees, mangroves, docks or between pylons. As you approach the general vicinity of the strike, you hear another. But it’s strangely muffled, and you know what that means. A big fish has burrowed its way far back under the overhanging branches or structure , and it’s rooting around, stacking bait into corners where it can feed at will. The problem? It’s so far back or under the “junk” that there’s no way to present your lure. So you sit there with a wistful look on your face, listening to that big fish ravaging bait within feet of you, as unreachable as the moon. So…what are your alternatives? Well, you can drift a live bait on the shadowy edge of the shoreline. You can try to sneak your plug a few inches under the overhanging leaves, knowing that a hang-up is likely. You can chug a big top-water lure through the open water and try to make enough noise to lure that fish out. . But take heart. There’s a technique that — while not always practical or necessary — can change the way you approach structure fishing. Simply put, “skipping” provides access to fish that once seemed unreachable. If that doesn’t get your attention, what will? Skipping works best when fish are far under some sort of structure that prohibits conventional casting methods. Mangrove shorelines — especially at higher stages of the tide — are a perfect place in which to skip a lure, but docks in residential canals make great targets, as well. Any place that offers structure, shade and some semblance of protection — as well as an overhang that seemingly negates the chance of standard casting methods — qualifies as a good spot to skip lures. A wide variety of lures can be used for skipping, from hard-bodied plugs to jerk-baits, depending on the skill of the angler. Naturally, a smooth bodied lure that will “roll” or hop atop the water’s surface when cast is the best bet, and lures featuring flat sides and bulky hooks are much harder to skip. I have friends who can skip plugs under mangroves with great accuracy, but I prefer to use the skip-bait standard: a relatively smooth soft-bait rigged “Texas-style.” This article will address those types of lures specifically, since in my opinion they are ideal for this type of angling. Soft-baits were originally designed for freshwater bass fishing, and those freshwater anglers were the first to discover the advantages provided by skipping. That discovery has led to the creation of a wide variety of soft-baits that are ideal for bouncing into tight places. My choices have been the DOA jerk bait, shad and curly tails, terroreyz and their shrimp.I also have been using Texas Tackle Factory's Hackberry Hustler. There are others that are great for skipping. “Texas style” rigging — which results in the hook being flipped 180 degrees and stuck into the body of the lure, rendering it weedless — is ideal for this application. Of course, like any type of lure, anglers will develop their own preferences. My advice: buy two or three styles and see which you like best, then stick with that brand until you master it. The premise behind skipping lures is easy. It’s accomplished using the same philosophy used to skip a stone across a lake’s surface, though that feat is a bit more challenging when accomplished with a rod and reel. The idea is to get the lure moving toward the intended target on a very low, flat trajectory, so that it hits the water at such an angle that it does not “dig” and sink; rather, it touches the water’s surface lightly in a series of hops, and comes to rest where the angler intended. To skip a lure, leave it hanging a couple of feet from the end of your rod, or about the length of your leader line. Start with the rod tip low and pointing toward the water, “load” the rod with a short back-swing and cast the lure — again, with a low trajectory — toward your target. As the lure moves through the air and across the surface, feather the line with your free hand. The object is to get the lure to contact the surface a few feet in front of the opening so that it skips back under the overhanging structure and comes to rest as far back into the open area as possible. Sound easy? It’s not — until you get the hang of it. This technique calls for quick reflexes and a tight drag. Big fish that pounce on skipped lures hold most of the cards; they’re already far back in the structure and a second or two of slack line is all they need to wrap you around roots or a dock piling. Your reflexes need to be sharp and your vision and hearing acute, and you’ll be engaging in short, dirty brawls that usually end — one way or another — soon after they begin. While some anglers can skip lures effectively with bait-casting reels, the rest of us mortals will do much better with a spinning outfit. Why is a spinner generally more effective? Spool spin. While bait-casting reels offer wonderful control and placement, they tend to backlash frequently when used for skipping, especially when used by inexperienced anglers. Stick to spinning reels, at least while you’re learning. A 6’-6” to 7-foot, medium to medium-heavy action rod works fine, along with a medium-sized spinning reel loaded with 10-17 lb. test (depending on the density of the structure and the size of the average fish). 20 to 30 lb. leader line is fine. Remember, the lighter line you use, the more accurate your casts will be, but go too light and you’re bound to lose many of the up-close battles. I tend to use 12 lb. test for most of my shoreline skipping, but I’ll quickly switch to 10 lb. test if most of the fish seem to be on the small side. I lose the occasional pig, but I prefer the accuracy afforded by lighter line, as well as the greater demands it puts on me when a big fish is hooked. 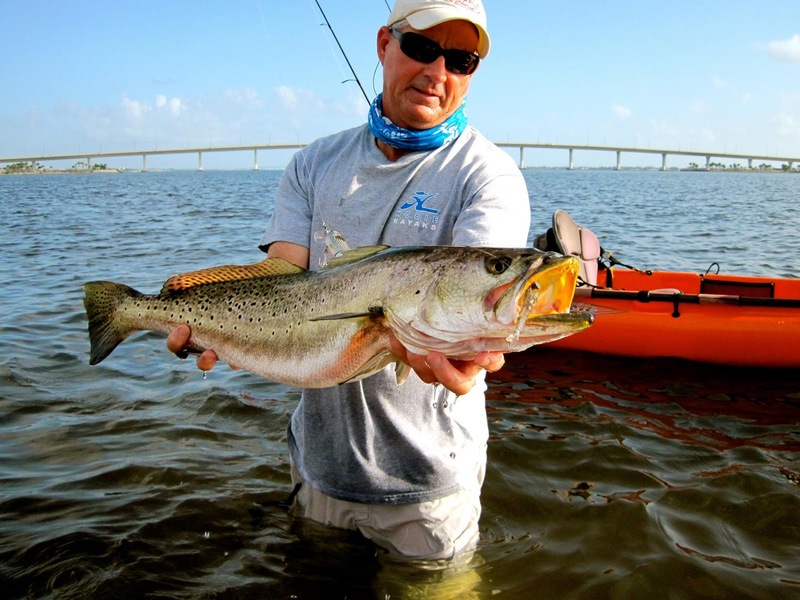 Skipping lures can work well at practically every tide stage, with the notable exception of very high tides that literally push the water surface up flush with the overhanging structure. Very low tides often force fish into deeper water, so to have your best chance at skipping success, check your tide charts and try to fish the middle stages of each tide. Keep an eye open for signs that betray feeding fish, like those maddening pops far under the mangroves that used to drive you crazy until you learned about this creative technique. the rod back to your right, keeping the point low. Note: As you perfect your technique, experiment by skipping your lure off of the water’s surface both closer to and farther away . By learning how to skip lures using a wide variety of angles, you’ll be prepared for practically any casting challenge. The surf is barely there, just a gentle washing of the sand, enough to turn up the sandfleas that the sanderlings race to capture, always an inch ahead of the foam. Gulls are crying, high and far off. Crabs track sideways, their feet making crosshatched trails to their holes. The sand squeaks under foot. And down the trough, between the sand and the bar, comes a silver-gray shadow longer than a man’s leg. It is a “beach bomber,” a giant snook, in water barely deep enough to float its bulk. The fish actually swims the waves up on the sand, grabs a crab, and then swims back into the trough, zigzagging its way along the shore toward where you wait, hoping. Flip a plastic shrimp down the beach, to the place where water meets land, and wait until the fish swims close enough to see it. Twitch it twice, little puffs of sand coming up beneath. A rush, a thump as the bait goes down the hatch—and 10 seconds later you’re looking at the spool as the last few turns of line threaten to disappear. And then running hard down the beach, trying to crank, screaming like a madman, tourists scattering, convinced that there must be a shark close by. If you’re lucky, in 10 minutes or so, you’ll wade out, cradle the big old gal in your arms for a few minutes, maybe ask a beach hiker to snap a photo with your pocket camera, and then let her swim off while you head back to the sand to do it again. Catching a 40-inch snook is never a gimme, and it probably never was, not even in the days when the snook was the “soapfish” that nobody wanted on their table or on their hook. 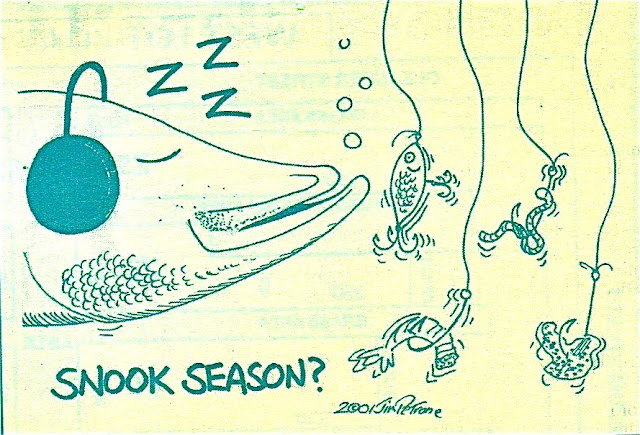 But odds today are likely better than they have been in at least 50 years, thanks to years of no-harvest on big snook. And a few savvy anglers are learning where these monsters can be found with some regularity. With careful handling, these great catch-and-release giants can provide lifetime memories, and still complete their part in the spawning ritual year after year. But where is the best snook fishing in Florida? One of the places the big fish show up most consistently is along the beaches within a mile or so on either side of the spawning passes. Prime time is delineated by the closed season; May through August on the Gulf Coast, June through August on the Atlantic coast. And the east coast gets lots of bonus fish during the annual mullet migrations, as well, typically in October and in April. For those concerned about impacting spawning fish, remember that most of the beach bombers have already done their thing inside the passes at least once, usually on the new or full moon, before they begin making feeding excursions along the beaches. Biologists think the fish may move out to feed, then return into the passes several times over the course of the summer before the breeding cycle ends and the fish disperse to other habitat. Expert to find big fish along the beaches. The preferred tactic is to swim a large sardine or threadfin in front of the giants. Live sardines are the prime offering, but dragging a bucket of them down the beach with you is a pain. Jumbo shrimp work equally as well, but again you’ll be doing the bait-bucket drag. For the sardines, a size 1 or 1/0 livebait hook is the ticket, while a size smaller hooks are best for the shrimp. Despite the size of the fish you’re after, the smaller hooks get more bites. Artificials work well, with the more realistic stuff like plastic shrimp and crabs at the top of the list. Suspending sardine imitations also catch fish—the Mirr-o-dine from MirrOlure is hard to beat—and so do soft jerkbaits and swimbait type jigs. If the water is a little roily, they will also occasionally wallop topwaters like the venerable Spook, Spittin’ Image, She Dog and others. Getting a topwater strike from a visible giant will truly make your day. Flies work well for surf snook, too. Eight-weight gear with plenty of backing on the reel will do the job nicely, and the typical inshore flies including Clousers and Deceivers in lighter colors are a good bet. The soft delivery with the fly rarely spooks the fish, though you have to be able to cast quickly and not wave a lot of false casts over the fish’s back. Also consider the wind’s direction and its strength. A strong onshore wind completely wipes out the action. But the more common summer breezes—off the land in the mornings—means slick surf, clear water and fish will be easy to spot, particularly on the West Coast, where you have the sun behind you in the a.m. You’ll need good Polarized glasses of course, with side shields and a hat. Walk the edge of the surf and look ahead, watching for a fin, a swirl, anything out of the ordinary. 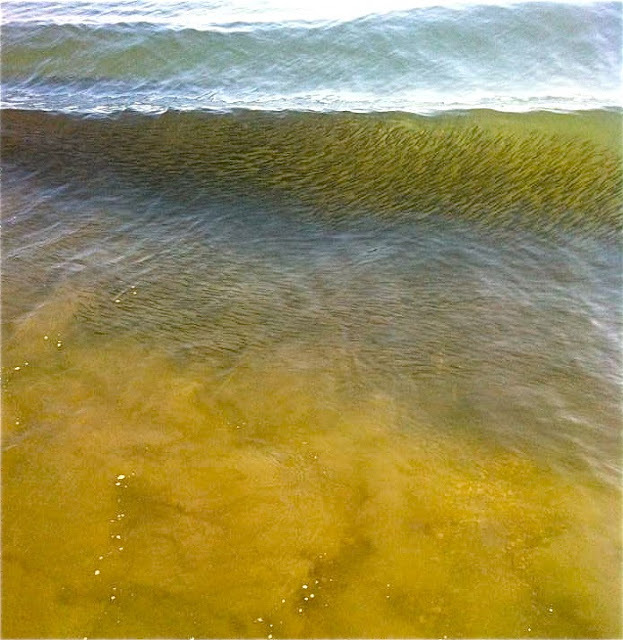 Tides don’t make as much difference on the beach as they do in some other snook habitat, but I’ve always had best luck on a rise—fish know there will be food getting submerged as the water goes up higher, so they go on the prowl. Just don’t make the classic Yankee-tourist mistake of wading out to your belly and then casting as far beyond that as possible, because if you do, most of the fish are going to swim behind you. On extreme low water, some fish likely will be outside the first bar, but otherwise they’re usually inside the trough. Because prowling fish swim down the trough for considerable distances, it’s often possible to make several presentations to those that don’t take the first time. Simply get back up on the sand a few yards so they won’t see you, run ahead of them, and let them swim into range again. Small stingrays are a common part of the fauna along the beach, and these little guys often take on the color of the sand, or cover themselves lightly with it, so you have to watch your step anytime you go in the water. The little ones won’t send you to the hospital like their mamas, but they can sure ruin your day. en the bikini crowds start to arrive. Best luck will be between about 8 a.m. and 10—light is good enough to see into the water then, but the swimmers are few. On the Atlantic coast, there’s always a good sunrise bite, but actual sight-fishing is best from noon to 5 p.m.—which is problematic on many days, as seabreezes and afternoon storms are typical of summer. Another approach is to fish along beaches where swimmers are rare. For instance, island beaches with no bridge access are often good. Pick a calm day and you can park your boat just off the sand, hop out and start walking. The usual precautions for anchoring off an exposed beach are always wise, of course, no matter how flat the surf; run a long line off the bow to your heaviest anchor placed well offshore, and another from the stern cleat to the beach. That way, boat wakes or the occasional swell won’t give you a nasty surprise when you get back to the boat. 1. Debarb all hooks. Pinching them nearly flat with pliers works best. 2. Use circle hooks with live bait. These are less likely to be swallowed. They also hook up very well, so long as you simply reel them into the fish rather than using a hard rod set. 3. Use single-hook lures where possible. 4. Release fish promptly after removing the hook. 5. If you do a “grip and grin” shot, make sure to support the fish at the base of the tail as well as at the jaw. Hold them up horizontally rather than vertically, and don’t put a lot of pressure on the jaw. An in-the-water shot also works nicely. 6. Help tired fish revive by walking them in knee deep water until they swim on their own. Mangrove snapper and black drum have remained prominent around the docks. Early morning and late afternoon the reds and c/r snook have also been the catch around the docks. (a few anglers are having great luck North targeting redfish!) Try fishing the East side of the lagoon for c/r snook and reds as well. The trout bite has been good around the spoil islands! Anglers fishing the surf are having good luck with c/r snook, blues, jacks, whiting and thetarpon bite is on! in the car and go a half mile to the next be fore you take out all your equipment, you will find the bait. 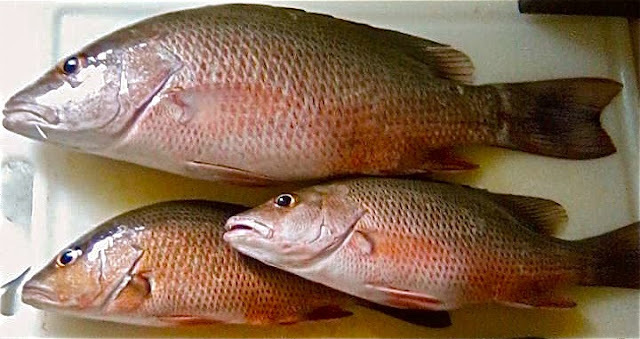 Plenty of big Croakers and Whiting for an excellent dinner so again do not forget the ice. if he took your baits. It's a beautiful morning at the inlet. Winds are blowing out of the North at 5 mph and the water is calm. We received an update from inlet regular Mike Ricciardi of Vero Beach who fished the north jetty yesterday morning through early afternoon. Mike reported a good day, overall. The water has settled down and the seaweed has diminished but it's still fowling lines. Early morning brought three slot Reds over the rails to Mike, Chuck Fischer and Larry Robison on live mojarra. The Snapper bite was slow, but steady enough for Mike to get his limit of 5 by 1:00 p.m. Vern Roberson of Winter Haven landed a nice one that was 16". A couple of C/R Snook were landed and released by Rick Jablonski. Alberto Morales of Vero Beach hooked up with a huge Goliath, around 300 lbs., that was lurking under the north jetty, which broke his line after about 30 minutes. Our first photo today features 12 year old Garrett Zeak who landed this 32" C/R Redfish on the incoming tide using live shrimp. The Red was released unharmed after the photo. Jose Dore landed this 27.5" C/R Redfish in our other photo using live shrimp. He missed the slot by 1/2"; the Red was released unharmed after the photo. Snook season opens again on Sunday. Please take a few moments to read the FWC guidelines and fishing etiquette pages. Governor Scott has declared Sunday, September 1st as a "no license required" day for tourists and residents. Last week we talked a little about picking out the right lures for the right situation. Just to re-cap last weeks article, you are trying to choose a lure that is the right size for the forage in the area, stays in the strike zone, and most importantly one that you have confidence in. Now we are going to get into color selection. 1) You can’t go wrong with a natural color. You’ve heard it over and over; match the hatch, a simple but effective way for choosing the right color. The hard part can be finding out what exactly the fish are keyed in on. The solution, ask your local tackle shop. If it has been a while since the last fishing trip, ask again, the forage tends to change a lot throughout the year. Don’t forget about the food chain, if you’re watching guys catch ladyfish on glass minnows a large imitation ladyfish makes a great lure for targeting the larger species. DDX makes a great soft plastic ladyfish imitation that can be rigged for slow or fast current situations. 2) Low light vs. high light situations. I have always done well in high light situations with natural colors that flash or have flake in it that reflects a lot of light. D.O.A.’s clear holographic (382) is great for clear high bluebird skies. I have seen many summer days when snook will hit the #382 shrimp or cal plastics out of aggravation before they will touch live bait. On the other side of the spectrum on those pitch black nights a dark color moving slow will get the job done when it come to ambush predators like snook, trout, bass, and others. 3) Water condition is another factor that comes into play when selecting a color. In water with low visibility you want to use a color that will stand out, like your chartreuses or whites. On days or nights when the water is brown and there is almost no visibility I have always done well with a large white swimbait. Storm’s Wild Eyed Shad is a good choice, and size is important. If it’s early in the season smaller is better. One of the other things I have noticed over the past few years is when the water is that milky green color and there is a lot of seaweed around a lighter colored soft plastic with red flake in it will out fish other colors most of the time. When it comes to flairhawking, don’t be afraid to throw yellow or chartreuse in clear water…it will get bit. 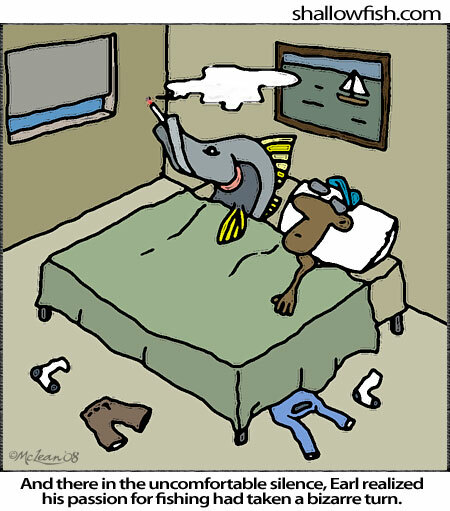 Every day is different and the fish’s mood can change at any time. It’s a good idea to carry a few different size and different color lures with you and experiment. Start small and light and work your way to larger lures until you find what the fish are in the mood for. If you are getting a lot of bites on small lures and that stops suddenly, break out the big lures and try to catch that fish of a lifetime! Walking into a wall of lures at a tackle store can be a bit bewildering at times. Rows of different sizes style, and color lures can leave even the most seasoned angler scratching their head. Luckily though, by keeping in mind three simple things; picking out fish catching lures can actually be very simple. 1. You’ve heard it before, but it remains the most important factor in picking out a lure, “MATCH THE HATCH”. Picking out a lure roughly the size, shape, and color (more on color soon!) of the most common forage should always be your base starting spot for picking successful lures. It makes absolutely no sense to buy a 12” mullet swimbait when gator trout are keyed in on shrimp. On the flip side when giant snook are blasting mullet along a seawall a DOA shrimp is not going to get a whole lot of attention. Not sure what the prominent food source is in a specific area? Ask the local tackle store; if a local tackle store can’t answer that question, it may be time to look for a different bait shop! 3. When picking out a lure, the angler must feel confident in your choice. It is a funny thing to consider, but it may be the most important factor. If the angler feels good with what is tied on to the end of the line, more bites will follow. The fish can’t see confidence, but it results in more bites than anything else. Confidence baits may not fit the above two criteria, but they are hugely important to have in the tackle box! 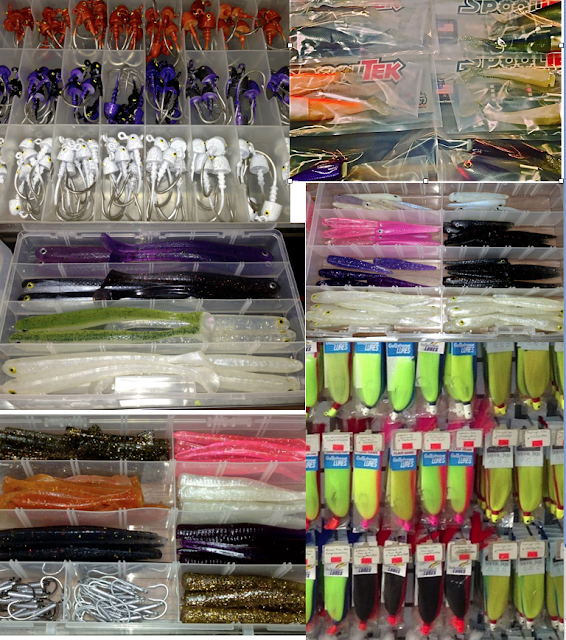 Here is a quick list of some of our confidence baits here at Juno Bait. We will almost always have these lures with us, anywhere we go, and be able to fit the top two points and feel good about what we are using! Capt.Joe at Whites Tackle "Stuart"